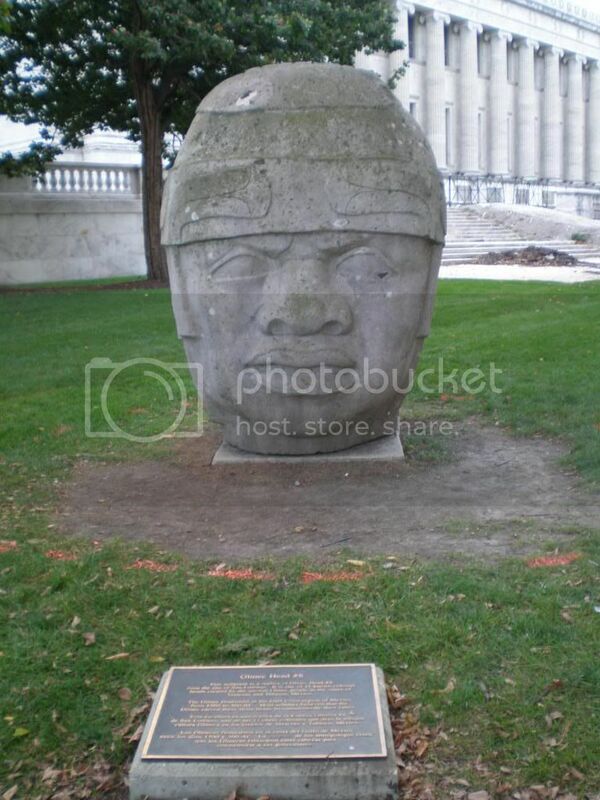 The Olmec colossal heads consist of at least seventeen monumental stone representations of human male heads sculpted from large basalt boulders. The heads date from at least before 900 BC and are a distinctive feature of the Olmec civilization of ancient Mesoamerica. All portray mature men with fleshy cheeks, flat noses and slightly crossed eyes; their physical characteristics correspond to a type that is still common among the inhabitants of Tabasco and Veracruz. The boulders were brought from the Sierra de los Tuxtlas mountains of Veracruz; given that the extremely large slabs of stone used in their production were transported over large distances, presumably involving a great deal of people and resources, it is thought that finished monuments represent portraits of powerful individual Olmec rulers; each is given a distinctive headdress. The heads were variously arranged in lines or groups at major Olmec centres, but the method and logistics used to transport the stone to these sites remain unclear. The discovery of a colossal head at Tres Zapotes in the 19th century spurred the first archaeological investigations of Olmec culture by Matthew Stirling in 1938. Dating the monuments remains difficult due to the movement of many from their original context prior to archaeological investigation. Most have been dated to the Early Preclassic period (1500–1000 BC) with some to the Middle Preclassic (1000–400 BC) period.